This classic American style depot design was used by many railroads in the first half of the 20th century. The depot would be a focal point of the town receiving passengers, freight, mail, merchandise and needed supplies several times a day. A few of the railroads that used a similar design for their depots include the Milwaukee Road, Chicago Northwestern, and the Canadian Pacific. 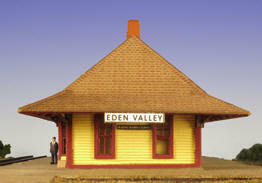 This model is developed from Soo Line "Standard First Class Depot" plans. 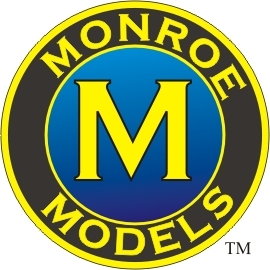 The roof and walls feature Monroe Models exclusive 3D clapboard and shingles for N scale, which make an accurate and easy to assemble model. All components are precision laser cut with peel and stick windows, doors, and trim for simple painting and construction. The kit is made of laser cut basswood, micro plywood, fiber board, plastic parts, plus cast chimneys. Also included are vintage advertising signs, town name boards, and instructions with photos and diagrams to make assembly easy and fun! Special Note: A few of the early kits to get packaged did not have window openings on part W3. This PDF file has a full scale diagram of where you need to cut out the window openings. Print at 100% and use the printout as a template. Please use the "Add to Cart" button on the N scale page to Order. VISA or Master Card Accepted.